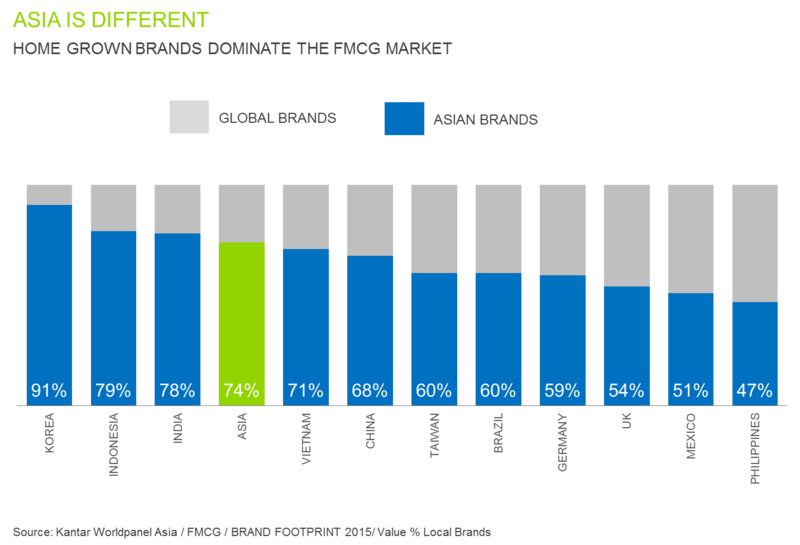 Asian brands are reinforcing their dominance in most markets, particularly China: 74% of Asian shoppers’ FMCG spend is on domestic brands, which are growing at twice the rate (8%) of global brands (4%), and therefore winning a greater share. In Taiwan, the market has become stagnant with no significant growth in both in the most recent year. 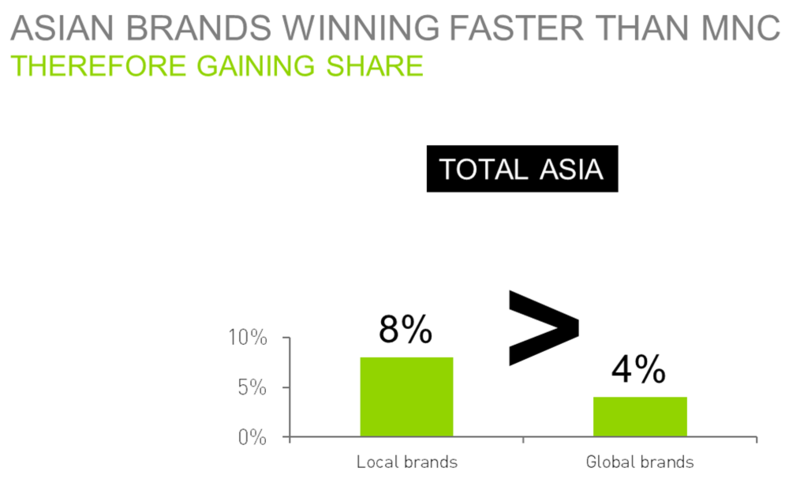 However, there is a 44% growth rate in global brands which is similar to Asia’s (39%), and 50% in local ones. Though domestic brands in Taiwan grow faster than global ones, they are still behind the average level of Asia (70%) due to the impact of food safety scandals in these years. In addition to the rapid growth, home ground brands dominate the Asia FMCG market with the share up to 74%, with 92% of South Korea the most prominent, which is the highest in Asia. Taiwan multi-national brands share the same average to global, which is about 40%, higher than the Asias average of 26%. This reflects that global brands still show a high importance in Taiwan market. However, if refers to the trend in other Asian market, Taiwan domestic brands and Asian ones still possess the potential to win a greater market share. 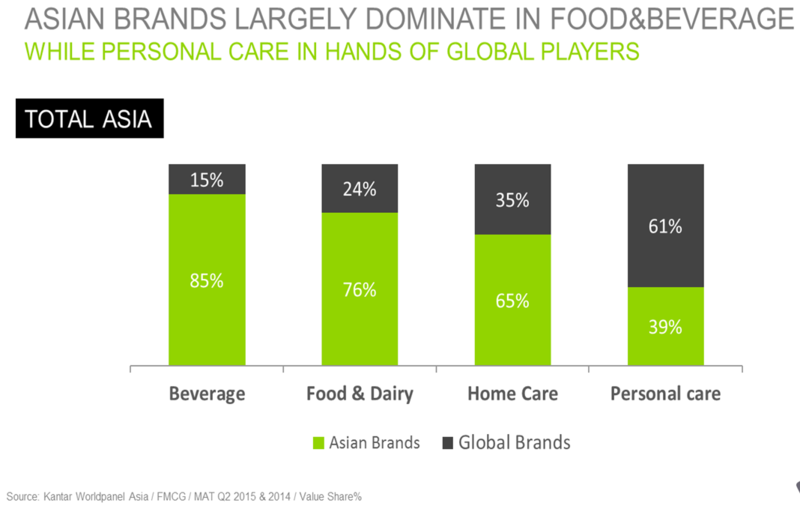 Asian brands largely dominate the beverage market with the 85% share; with 76% in food and dairy also show the importance. Owing to consumers in Asia are real foodies – they love home-cooked tastes and original recipes ‘like mum makes’. Asian brands excel at catering to the local palate, and as a result they lead in the many categories that are uniquely popular in the region – such as coconut milk, RTD tea, soy milk, seasonings, table sauces (e.g. fish sauce, oyster sauce, soy sauce) and instant noodles. The biscuits and snacks categories are also largely dominated by Asian brands, which satisfy local tastes with flavours such as seafood and coconut. In Taiwan, in response to consumer needs as well as the pursuit of quality and safety for healthy living, innovative brands that follow consumer trends show a great success with two digit growth. For example, in food categories, such as I MEI, QUAKER Great Day, Tian De He Bu, Cadina, Chu shui Chen, Taiwan Sugar, Tai Yen, Pro-Partners, Barista, Chu Lu Ranch, Super Supau, Apple Sidra. As for non-food categories, for instance, May Flower, De-Yi, Orange house, Paseo, Carnation, Dr. Formula…etc. 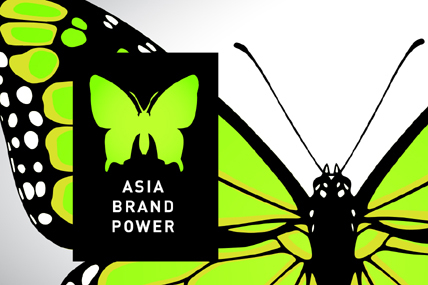 Asian Brand Power – What’s next? With these international aspirations, however, come new issues for our Asian Giants to contend with. As they migrate overseas, many of the reasons for their domestic success – being highly attuned to the cultural norms of their consumers, for example – may no longer be valid. Monde Nissin, one of the Philippines leading Food Manufacturers, has, for example, followed a very clever international expansion strategy by following the Filipino diaspora to the 35 markets where they now live and work. The keys to overcoming these obstacles to internationalisation, however, are already in the DNA of our Asian Giants. Understanding the consumer – the “intuition” that has got many of the Asian companies to where they are today, can no longer be relied upon solely as it needs to be supplemented with research into the cultural insight of the new market, the aspirations of your new consumers, and their unmet needs. Experimentation – “launch and learn” models are already the norm for these brands and maintaining that experimental attitude, complemented by their agility to alter and adapt the plan, will allow brands to tailor the approach quickly. Connectivity – as the digital world takes over more and more of our consumer’s lives, staying connected to them and engaging with them in meaningful ways will continue to dominate commercial plans. What is meaningful in one market may be seen as frivolous in another, however, and so, yet again, consumer understanding is critical. vision whilst energising talent from many cultural backgrounds giving them frameworks to work with whilst allowing flexibility to win locally. For those Asian Giants with aspirations to continue driving their dominance in their home market, through increase distribution as well as launching into, or indeed creating, new categories, these “keys” also ring true. As economic growth slows down in Asia, identifying new opportunities and unlocking them will also centre on consumer understanding; nurturing talent; agile experimentation; and connectivity. The Asian Giants operate in a variety of sectors – from ready-to-drink tea to home care. They range in size from state-owned companies to family businesses, originate from disparate geographies, and are at different stages of development – from new to well-established. To our surprise, they all had more commonalities in terms of their strategy, approach, challenges and vision of the future than differences. There was also a clear pattern to the factors that have driven their success. Five key broad themes emerged, each rich with valuable lessons for their peers in other Asian countries and brands from overseas alike. Our Asian Giants have all gone through a transformation: shifting attention and innovation from manufacturing to the brand, and moving from a factory-centric to consumer-centric operation. These companies, so deeply rooted in society, are close enough to feel the pulse of the change. They move fast, fail fast and learn fast – if something isn’t working they adjust and try again. What is more, expanding beyond their country of origin with complete confidence; wherever their consumers move to, they follow, establishing a strong presence in overseas communities. Reflecting national culture, pride and values in an authentic way plays a critical part in the success of these Asian Giants. They also create culture – identifying the intrinsic, often unspoken cultural truths that run through daily life, and embedding them in their brand narrative. Asian companies find competitive advantage by blending old traditions with new ones, and embracing the best of both worlds. These companies prioritise consumer-driven innovation. They follow an ‘Imitation Plus’ approach, taking the things consumers love about products from global brands then adding something of extra value, often with a local twist. Our Asian Giants learn how to apply digital technologies, both to create and sell products and to engage consumers. They excel at exploiting highly interactive, two-way communication to build relationships and become part of consumers’ lives. They also listen to the feedback they receive on social media, for instance, and use it to adapt their approach. While it is still important to demonstrate and promote superior functionality in advertising, this needs to be done with an emotional overlay – telling a brand story that is compelling, personally relatable and memorable. Living side by side with the consumers they serve gives Asian companies an advantage. The ability to observe and listen to them first hand, and familiarity with local tastes and desires, brings an instinctive understanding of what will work. The Asian Giants have combined this with ongoing market research that provides unbiased, actionable consumer insights. These help them to grasp cultural truths as they evolve, understand what consumers want, and set simple performance indicators against which they can measure performance. These Asian Giants are now poised to expand internationally. The next big question will be how to sustain their winning growth as they do. They need to be ready to face the same concerns and challenges as the multinational brands entering Asia today – such as the difficulty of unseating strongly-rooted local favourites, and the need to localise products. To operate successfully in multiple countries they will need to keep on transforming, and they must not lose their agility, dynamism and entrepreneurial spirit as they get bigger.